Research into the stability of matter has been one of the most successful chapters in mathematical physics, and is a prime example of how modern mathematics can be applied to problems in physics. 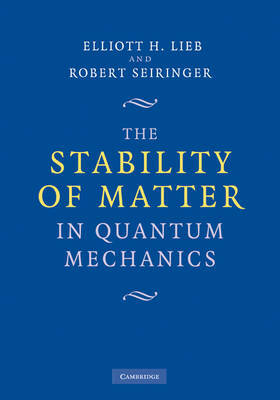 A unique account of the subject, this book provides a complete, self-contained description of research on the stability of matter problem. It introduces the necessary quantum mechanics to mathematicians, and aspects of functional analysis to physicists. The topics covered include electrodynamics of classical and quantized fields, Lieb-Thirring and other inequalities in spectral theory, inequalities in electrostatics, stability of large Coulomb systems, gravitational stability of stars, basics of equilibrium statistical mechanics, and the existence of the thermodynamic limit. The book is an up-to-date account for researchers, and its pedagogical style makes it suitable for advanced undergraduate and graduate courses in mathematical physics.